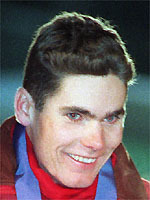 Regarded in Norway as the natural successor to the legendary Bjorn Dahlie, Thomas Alsgaard deprived his compatriot of even greater success by winning two Olympic gold medals at Lillehammer (1994) and Nagano (1998) respectively. He then defended his pursuit title at the Salt Lake Games in 2002, when he was eventually awarded joint gold medals with compatriot Frode Estil after Spaniard Johann Muhlegg was stripped off his title for doping. Alsgaard and Estil originally crossed the line together in second behind Muhlegg after an epic battle. The veteran Alsgaard than anchored the Norwegian relay team to a successful defence of the title they won in 1998. Alsgaard, who also anchored Norway to Olympic relay gold over Italy in 1998, threw his ski poles into the air in delight after staging a thrilling comeback to deny Italian Cristian Zorzi what looked like a certain gold medal. He began a rigorous training regime at the age of nine, and at 22 was a member of his country's team for his home Olympics at Lillehammer in 1994. A member of the team that finished second, a single ski length behind Italy in the 4 x 10km relay, Alsgaard's glory came in the 30km freestyle when he came home just under a second ahead of the great Dahlie to take gold. Observers saw Alsgaard as the most serious pretender to Dahlie's crown. Until then, Dahlie had towered over the world of cross-country skiing like a colossus. But now Alsgaard, who grew up in the same village as his great compatriot, was ready to usurp him. The two Norwegians continued their struggle for supremacy at the 1998 Games in Nagano and it was Alsgaard who emerged on top after the pursuit, winning gold, before forming part of the Norwegian quartet that went on to win the relay. For good measure, he took the overall World Cup title the same year to complete a fabulous season. At the world championships in 1999 at Ramsau, in Austria, he won the 15km freestyle title, adding second place finishes in the 30km freestyle and relay. He almost snatched the overall World Cup title from Swede Per Elofsson in 2002, and in the end just three points separated the two racers. Despite turning 31-years-old in January, 2003, he won two more gold medals that year by claiming the 30km event at the world championships in Trentino, Italy and brilliantly anchoring Norway to the relay title edging Axel Teichmann of Germany in a thrilling sprint to the line. He wisely decided to go out at the top and retired in the close season.